The Fed Cup by BNP Paribas World Group II play-off is 1-1 after the first day of play at IGA Stadium in Montreal. Replacing Françoise Abanda in the first match of the day, Bianca Andreescu (Mississauga, ON) put up a tough fight against Lesia Tsurenko, but was forced to retire in the third set, losing 6-4, 3-6, 0-4. Eugenie Bouchard (Montreal, QC) tied things up for Canada, overcoming Kateryna Bondarenko by a score of 6-2, 7-5. 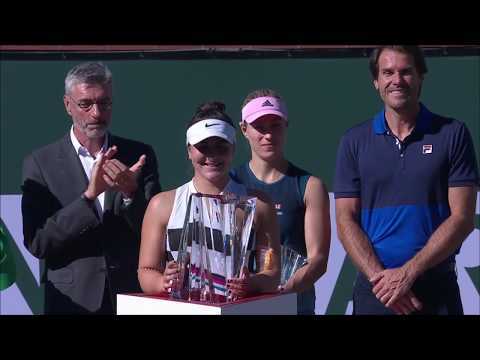 The Fed Cup by BNP Paribas World Group II play-off will continue on Sunday, with both winners from Saturday facing each other in the first match of the day. Bouchard and Tsurenko will be followed by a match disputed between the number two players from each team, Abanda and Bondarenko. The day will conclude with a final doubles match. A win over Ukraine will allow the Canadian squad to remain in the World Group II for 2019, while a loss will relegate them back into the Americas Zone Group I. Action will continue on Sunday, April 22 starting at 12 p.m. The matches will be broadcast on TVA Sports 2 and Sportsnet Now. Tickets are still available starting at just $25 for the day. A special rate is also offered for children aged 12 years and under at only $15 for the day. Fans who wish to attend to the upcoming tie can purchase their tickets by calling 514-790-1245 or online at www.admission.com. Please note that the Ticketing Office will only be open during the two days of the event for people who wish to obtain tickets on site.